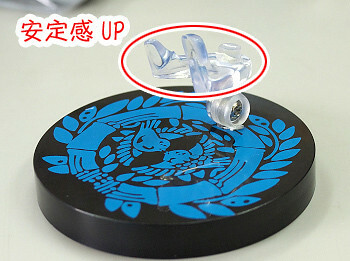 If you have read our review of Nendoroid Date Masamune, you should have known that his base adapter is a little quirky. Based on my own experience, it is kinda hard to dock Masamune onto the base and it is not too stable as well. Fortunately, Phat Company will have this problem fixed on the upcoming re-sale version of the one-eyed dragon‘s Nendoroid rendetion. They promise better stability and easier docking with this improved base adapter. Note that they only modify the base adapter; no changes to Masamune’s body or other parts. As for those who have purchased the first edition of this Nendoroid, it seems that Phat Company is currently looking into various solution to distribute the updated base adapter (excluding the pedestal and pillar). No further info has been confirmed though. This entry was posted in News and tagged date masamune, nendoroid, phat company, sengoku basara. Wow, that is pretty cool of Phat Company to get that change done for the resale and to try and get them to those who got the first release is good news too.